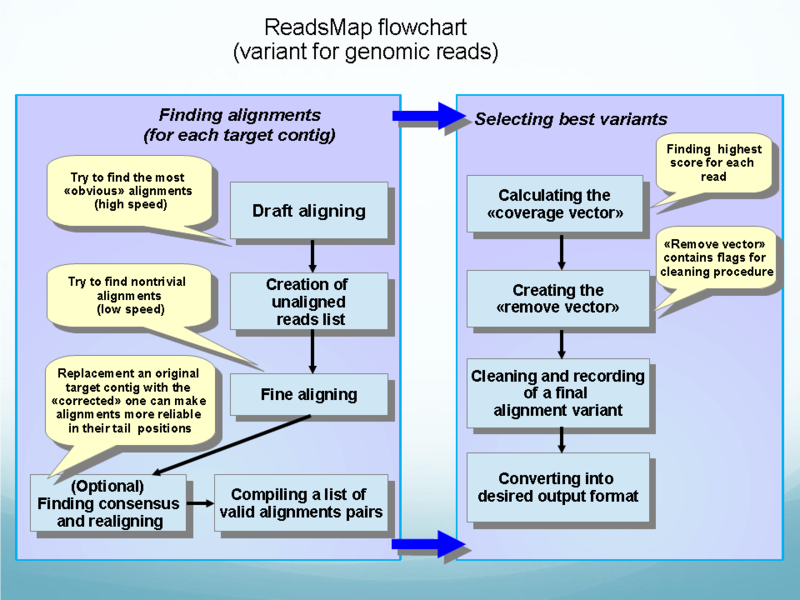 ReadsMap is a program for high accuracy mapping of large sets of short sequencing reads. The program exists in two variants, for genome sequencing and for RNA-Seq, the latter accounts for possible introns in a reference sequence. In the following example of a command line, single-end genomic reads (file reads.fa) are being mapped to chromosomes (chr1.fa,chr2.fa) of the same organism, allowing for deletions/insertions of up to four nucleotides. The results are being saved in subfolder ./da (must exist) in sam format. In this example of a command line, pair-ends genomic reads (file reads.fa) are being mapped to chromosomes (chr1.fa,chr2.fa) of the same organism, allowing for deletions/insertions of up to four nucleotides. Results are being saved in subfolder ./da in sam format. Average distance between external ends of a pair is 200, standard deviation of such distance 20.0. --chr: - list of chromosomes (contigs), comma separated. File format – FASTA. --chr_list: - File with list of names of files with chromosomes (contigs) (alternative to previous variant). List of filenames is separated by line feed (by one filename in the line). --reads: - File with reads. File format - MULTI FASTA. --masked - invoke masking (ignore lowercase letters). --paired - use the information on pairness of reads. In our tests, taking pairness into account increased the specificity (proportion of correct alignments) but, in some way, decreased sensitivity (ratio of correct alignments to total number of reads). By default, this parameter is disabled. Paired reads must be in a sequential order (even/odd). --max_indel:X Set the maximal length of deletions/insertions. --covSkew:X  Maximal deviation from the best coverage: alignments with quality not worse than 1-X of the best will be kept (will pass the filter). --cvt - Convert previously calculated *.da files into desired output format (alignment is not performed, only conversion). --sam  - convert the result to SAM format. --sbl  - convert the result to Sbl-like format (text format of alignment). --map  - convert the result into file with mapping coordinates. --stat:fname - create file with some descriptive statistics. --sites   - create  *sites files for FGENESH. --snp  Search for SNP based on resulting alignments set. The result will be saved in VCF format. --use_samtools - Use samtools for calculate SNP. NTHREADS    7  - number of threads to use during the alignments calculation. @MAXINDEL    4 - maximal length of isertions/deletions. @COVSKEW  0.01 - maximal deviation from best coverage. @USE_SAMTOOLS 1   - Use samtools to generate VCF file. File(s) with chromosomal sequence in FASTA format and a file with read sequences in MULTIFASTA format are used as input. Sequences of paired reads must be in order (even/odd). Preliminary data preparation can be performed using fastq2_2_fasta.pl script, as described in fastq2_2_fasta.txt file. Table 1. Parameters of sets of test reads. Potentially spliced high homology reads, no insertions/deletions, simulates errors of Illumna sequencer. Non-spliced reads with increasing frequency of mismatches (mutations) and limited number of insertions/deletions of uo tp 4 bp. * Time without indexing of reference genome, which took additional 65 sec. ReadsMap is a free for academic use. Please contact us at softberry@softberry.com for commercial license.